Rich walnuts and sweet raisins make a crumbly topping for slices of juicy nectarines layered with spoonfuls of lemon cashew cream. Time just has a way of slipping away from me; you too? Especially this time of year when I want to enjoy every delicious moment that summer has to offer. I want more lazy afternoons outdoors, more picnics at the beach, more ice cream (just because), and more juicy sun-ripened peaches and nectarines that drip and dribble all over your hands. But summer isn’t at its end quite yet and I’m making the most of what’s left. I’m determined to find every possible reason or excuse to prolong the pleasures of my favorite season just a bit longer and that includes making a few more of these stone fruit parfaits with layers of nut crumble and lemon cream. Fruit parfaits make a fresh and deceptively simple dessert that’s perfect for picnics and potlucks and this one is as straightforward as it gets. 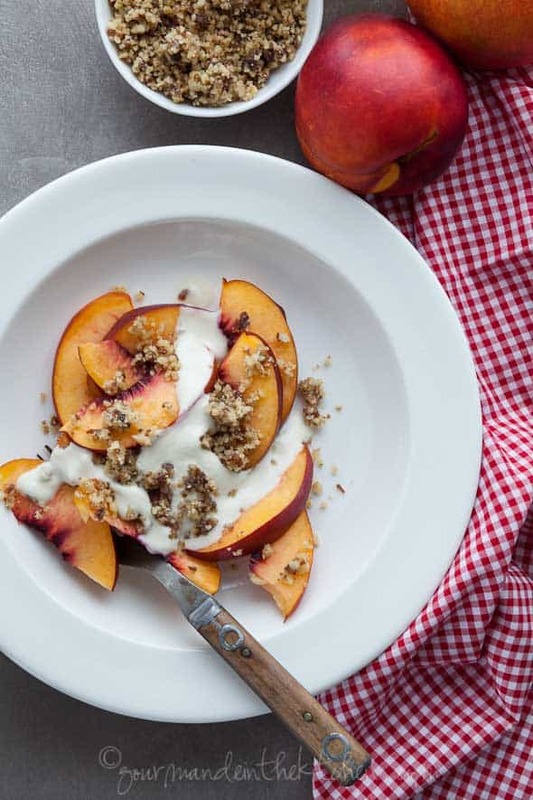 Juicy sweet nectarines are sliced and served with a generous sprinkling of raw walnut crumble and a drizzle of lemon cashew cream. The topping comes together in a flash in the food processor, and the lemon cream whips up in minutes in the blender. 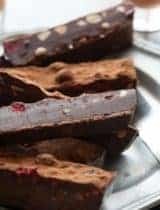 Both can be made ahead of time and kept in the fridge at the ready so that dessert (or even breakfast) is just minutes away any day of the week. Put the cashews in a bowl and add cold water to cover. Soak the cashews for at least 30 minutes (or up to one night in the fridge), then drain, rinse and pat dry. Place in an airtight container and store in the refrigerator for up to 3 days. Place the nuts and the rest of the ingredients in the bowl of a food processor. Pulse until even chopped but still chunky. 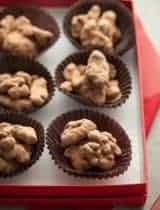 (The mixture should have a crumbly appearance but clump when you pinch it together.) 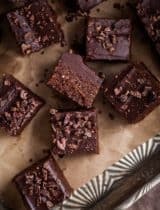 Place in an airtight container and refrigerate for up to 5 days. Slice or dice the nectarines into bite-sized pieces and toss with the lemon juice to coat. 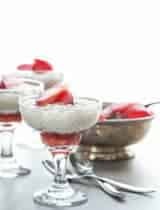 Place a spoonful of fruit in the bottom of a serving glass and top with a layer of crumble and a layer of the cashew cream. Repeat to create multiple layers if desired and serve. 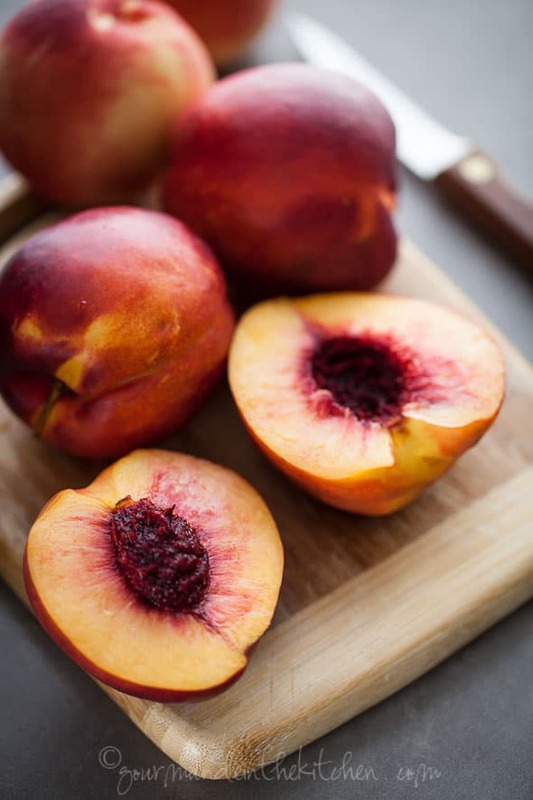 Perfect healthy stone fruit breakfast or dessert and lovely photography, Sylvie! So glad you're making the most of summer. Thanks for sharing! Oh! I'm so glad I'm coming into warmer weather. This looks stunning and so fresh! Just gorgeous Sylvie! Sylvie - I'm trying to stretch out summer as long as possible too! Love that walnut crumble. I love this Sylvie, it looks just great! 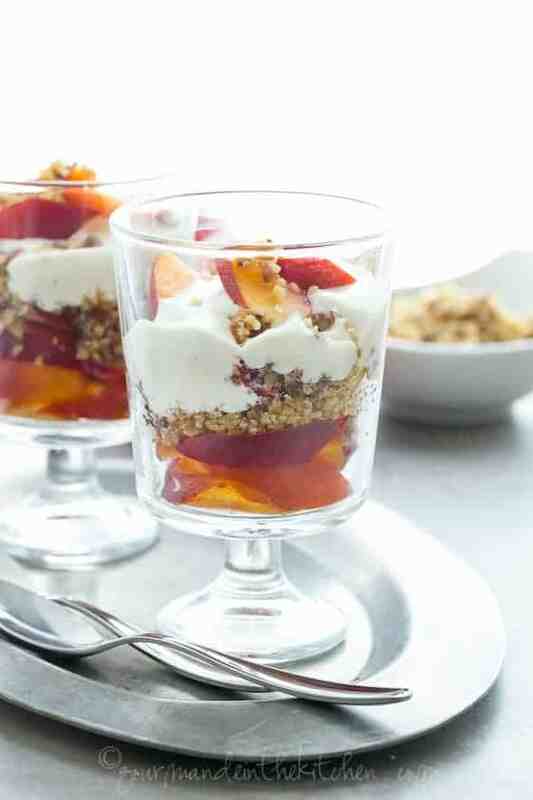 Nectarines are my favorite stone fruit; gorgeous parfaits! Perfect for a dinner party and so gorgeous! I love the arrangement in the glasses! What a great dish for the tail end of stone fruit season. Pretty and perfect little dessert. Lovely. For some reason, I can't see your featured image in Feedly. It's broken. Came over anyways. Best! Thanks for letting me know and for stopping by! Lemon in cashew cream?! Duh! Why didn't I think if that? A great topping for other desserts too I bet. Looks delicious. I can't wait to make this. I feel the same way about trying to get all the recipes in before summer ends - almost to the point that it stresses me out! Hah but this parfait looks like a real stress-reliever and I am LOVIN' the lemon cashew cream you put in these... Might need to add this recipe to the list of ones to make before the season is over! This is such a beautiful Summer breakfast treat! And your photos always stun me. Oh wow, great minds think alike! 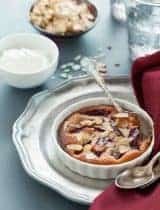 ;) I just posted a nectarine-nut related crumble, too... but I especially love that addition of cashew cream (I've got to try making this once I get my hands on my handy food processor). I'm seriously in love with walnuts. 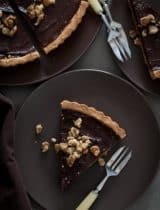 I might make the walnut crumble and eat it plain! 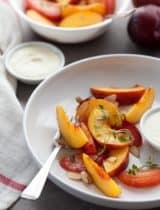 Yum ~ I've done nectarines w/ cashew cream before-so delicious! Love your walnut raising crumble too! This simple dessert sounds so wonderful, Sylvie. It's about time for me to try cashew cream! What a beautiful parfait with great flavors - I love nectarines! Perfect for summer! What can I say? The nectarines are so good this year. Yum. This is certainly a wonderful way to hold onto the last few days of summer. Fresh fruit in a light and healthy parfait. Just lovely. Thank you for sharing! I hope you had a wonderful weekend, and I hope you have an even better start to your week. I'd be more than tempted to call this breakfast as well as dessert. I've been loving stone fruits this season, and pluots, especially have been so lovely. I'll have to give this a go! Gorgeous! Would love these for a special breakfast! since it has fruit in it does that mean I can eat as much as I want? Sinfully delicious it looks! Nectarines are so perfect right now in Quebec. Thanks for the inspiration, Sylvie! I love nut-based cream and especially the ones brightened with lemony goodness! YUM :) Pinned!! I'm with you. I'm not ready for summer to end, but if I could have this treat before it does, I'll be happy. Nectarine season here in Australia is one of my favourite times of the year. I'll definitely have to try this then as it looks absolutely gorgeous Sylvie! You always make the most beautiful desserts. This parfait, with that wonderful cream, looks delightful... and it's freakin vegan and gluten-free. I'm impressed. I need to be better about making my own dairy alternatives. Cashew cream is now first on the list. That's a gorgeous post and lovely pairing of the ingredients. These are absolutely stunning! Cannot wait to make them! Picture perfect! Thanks for sharing. 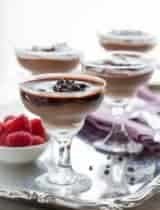 Terrific recipe, gorgeous pics. Perfect in every sense. I love it. You're parfaits are really good. Very exclusive and classy. It gives out that classy feeling even just by looking at it. And your combination of flavors are just amazing!